The main objective of the research presented in this paper is to assess the economic impact of the application of irrigation in the production of basic feld crops (maize, sunﬂower, soybean and sugar beet) on family farms operating in the South Banat area. Based on the data collected from the survey conducted on 75 family farms specialized in market oriented production without irrigation, using the method of models, calculation and comparison of the obtained results, an assessment was made of the economic impact of the application of irrigation in the production of basic feld crops, as well as the assessment of their business performance. It has been established that the most significant economic impact from the application of irrigation in the production of basic feld crops can be achieved on farms with 10-20 ha of arable land. Gross margins per hectare of arable land, depending on the type of soil prevailing in the holding, increased from 87% to 146%, while income per active member of the family farm dealing exclusively with agriculture could double. 1. Babović, J., Radojević, V., Radojević, V.V. (2004). The economic benefits of irrigation. Economics of Agriculture, 51(3-4), Institute of Agricultural Economics, Belgrade, 25-38. 2. Bojović, R. (2014). Morphological and productive properties of sugar beet genotypes in conditiones of intensive plant nutrition, Doctoral Dissertation, University of Belgrade-Faculty of Agriculture, Belgrade. [in Serbian: Bojović, R. (2014), Morfološke i proizvodne osobine genotipova šećerne repe u uslovima intenzivne ishrane biljaka]. 3. Bošnjak D., Rodić V. (2010). Comparative analysis of the basic feld crops production costs in Vojvodina. Economics of Agriculture, 57(2), Institute of Agricultural Economics, Belgrade, 233-243. 4. Bošnjak, Đ., Pejić, B. (1994): Realizacija racionalnog zalivnog režima kukuruza. A Periodical of Scientifc Research on Field and Vegetable Crops, 22, Institute of Field and Vegetable Crops, Novi Sad,167-178. [in Serbian: Bošnjak, Đ., Pejić, B. (1994), Realizacija racionalnog zalivnog režima kukuruza]. 5. Bošnjak, Đ. (2004). Drought and its relation to feld crops production in Vojvodina province. A Periodical of Scientifc Research on Field and Vegetable Crops, 40, Novi Sad, Institute of Field and Vegetable Crops, Novi Sad, 45-55. [in Serbian: Bošnjak, Đ. (2004), Suša i njen odnos prema ratarskoj proizvodnji u Vojvodini]. 6. Glamočlija, Đ. (2004). Special cropping - cereals and grain legumes. Draganić, Belgrade. [in Serbian: Glamočlija, Đ. (2004), Posebno ratarstvo – žita i zrnene mahunarke]. 7. Gujaničić, T., Glamočlija, Đ., Maletić R., Savić J. (2008). Production of sugar beet in conditions of intensive plant nutrition and irrigation of crops. Journal of Scientifc Agricultural Research, 69(1), SPITS, Belgrade, 69-78. 8. Dragović, S. (1994). The effect of irrigation in extreme drought years. A Periodical of Scientifc Research on Field and Vegetable Crops, 22, Institute of Field and Vegetable Crops, Novi Sad, 97-108. [in Serbian: Dragović, S. (1994), Efekat navodnjavanja u ekstremno sušnim godinama]. 9. Dragović, S., Maksimović Livija, Škorić, D. (2001). Water requirements of NS sunﬂower hybrids and impact of irrigation. A Periodical of Scientifc Research on Field and Vegetable Crops, 35, Institute of Field and Vegetable Crops, Novi Sad, 403-413. [in Serbian: Dragović, S., Maksimović, L., Škorić, D. (2001), Potrebe za vodom i efekat navodnjavanja NS-hibrida suncokreta]. 10. Dragović, S., Maksimović, L., Radojević, V., Cicmil, M., Radojević, V.V. (2005). Impact of irrigation on evapotranspiration and increase of sunﬂower yield in agroecological conditions of Vojvodina. Acta biologica Iugoslavica - series A: Soil and plant, 54(2), Yugoslav Society for Land Survey, Belgrade, 115-124. [in Serbian: Dragović, S., Maksimović, L., Radojević, V., Cicmil, M., Radojević, V.V. (2005), Uticaj navodnjavanja na evapotranspiraciju i povećanje prinosa suncokreta u agroekološkim uslovima Vojvodine]. 11. Živković, B.M., Nejgebauer, V.K., Tanasijević, Đ., Miljković, N., Stojković, L., Drezgić, P. (1972). Lend of Vojvodina. Institute for Agricultural Research, Novi Sad. [in Serbian: Živković, B.M., Nejgebauer, V.K., Tanasijević, Đ., Miljković, N., Stojković, L., Drezgić, P. B. (1972), Zemljišta Vojvodine]. 12. Kresović, B., Dragičević, V., Gajić, B., Tapanrova, A., Pejić, B. (2012). The effects of use self-propelled rain guns (typhone) in irrigation of corn (Zea mays L.). Agricultural Engineering, 4, University of Belgrade-Faculty of Agriculture, Belgrade, 31-39. [in Serbian: Kresović, B., Dragičević, V., Gajić, B., Tapanrova, A., Pejić, B. (2012), Efekti primene tifon uređaja u navodnjavanju kukuruza (Zea mays L.)]. 13. Maksimović, L. (1999). Dependence of yield and morphological characteristics of corn from soil moisture and irrigation system irrigation. Doctoral Dissertation, University of Novi sad-Faculty of Agriculture, Novi Sad. [in Serbian: Maksimović, L. (1999), Zavisnost prinosa i morfoloških karakteristika kukuruza od vlažnosti zemljišta i sistema đubrenja u navodnjavanju]. 14. Maksimović, L., Dragović, S. (2002). Effect of sugar beet irrigation in different environmental growing conditions. A Periodical of Scientifc Research on Field and Vegetable Crops, 36, Institute of Field and Vegetable Crops, Novi Sad, 43- 56. [in Serbian: Maksimović, L., Dragović, S. (2002), Efekat navodnjavanja šećerne repe u različitim ekološkim uslovima gajenja]. 15. Maksimović, L., Jocković, Đ., Dragović, S. (2004). Growing irrigated maize as an important factor in production advancement and stability. A Periodical of Scientifc Research on Field and Vegetable Crops, 40, Institute of Field and Vegetable Crops, Novi Sad, 257-268. [in Serbian: Maksimović, L., Jocković, Đ., Dragović, S. (2004), Gajenje kukuruza u navodnjavanju značajan činilac unapređenja i stabilnosti proizvodnje]. 16. Maksimović, L., Babović, J., Carić, M. Milić, S. (2010). The economic effects of irrigation and dunging in the sugar-beet production. Economics of Agriculture, 57(4), Institute of Agricultural Economics, Belgrade, 611-623. 17. Miodragović, R. (2009). Optimizing the application of mobile irrigation systems for plant production. Doctoral Dissertation, University of Belgrade-Faculty of Agriculture, Belgrade. [in Serbian: Miodragović, R. (2009), Optimizacija primene mobilnih sistema navodnjavanja u biljnoj proizvodnji.]. 18. Munćan, M., (2016). 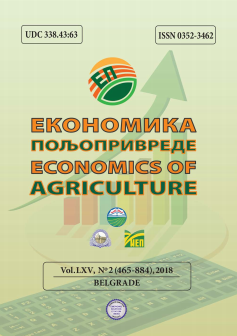 The impact of mineral fertilization and atmospheric precipitation on yield of feld crops on family farms, Economics of Agriculture, 63(3), Institute of Agricultural Economics, Belgrade, 817-833. 19. Pejić, B., Maksimović, L., Milić, S. (2007). The effect of irrigation on yield of corn hybrids from different groups of ripening. Acta biologica Iugoslavica - series A: Soil and plant, 56(2), Yugoslav Society for Land Survey, Belgrade, 59-66. [in Serbian: Pejić, B., Maksimović, L., Milić, S. (2007), Efekat navodnjavanja na prinos hibrida kukuruza iz različitih grupa zrenja]. 20. Pejić, B., Maksimović, L., Milić, S., Rajić, M., (2010). Effect of irrigation and nitrogen rates on yield and water productivity of sugar beet. Contemporary agriculture, 59(1-2), University of Novi Sad-Faculty of Agriculture, Novi Sad, 1-7. 22. Potkonjak, S., Mačkić, K., (2010). Production-economic effects of irrigation with special reference to small plots. Cotemporary Agricultural Engineering, 36(3), University of Novi Sad-Faculty of Agriculture, Novi Sad, 256-266. [in Serbian: Potkonjak, S., Mačkić, K., (2010). Proizvodno-ekonomski efekti navodnjavanja sa posebnim osvrtom na male parcele]. 23. Stojković, L. (1954). Crop farming of Vojvodina. Matica srpska, Novi Sad. [in Serbian: Stojković, L. (1954), Ratarstvo Vojvodine]. 24. Tabaković, M., (2012). Inﬂuence of weather conditions, soil and genotypic combinations on the properties of corn hybrid seed. Doctoral Dissertation, University of Belgrade-Faculty of Agriculture, Belgrade. [in Serbian: Tabaković, M., (2012), Uticaj vremenskih uslova, zemljišta i genotipske kombinacije na osobine hibridnog semena kukuruza]. 25. Todorović, S., Munćan, M., Ivkov, I., (2008). The signifcance and role of models in agroeconomic research. Thematic Proceedings - Agroeconomic Sciences and Profession in Transition of Education and Agroeconomy, University of Belgrade-Faculty of Agriculture, Belgrade. [in Serbian: Todorović, S., Munćan, M., Ivkov, I., (2008). Značaj i uloga modela u agroekonomskim istraživanjima]. MUNĆAN, Mihajlo. ECONOMIC EFFECTS OF IRRIGATION OF BASIC FIELD CROPS ON FAMILY FARMS. Economics of Agriculture, [S.l. ], v. 65, n. 2, p. 787-800, june 2018. ISSN 2334-8453. Available at: <http://ea.bg.ac.rs/index.php/EA/article/view/496>. Date accessed: 19 apr. 2019. doi: https://doi.org/10.5937/ekoPolj1802787M.